Please scroll down to read our client comments, and then click the links for more information about our party packages, princess characters, and frequently asked questions. Then contact us with your party date and desired princess. We'll do the rest! Simply Divine Entertainment made an appearance at my daughter's 7th birthday and made it unforgettable! The princess was incredible! The kids believed her in her role and she did activities with the kids that were fun, creative, and interactive. She loves her job and everyone can tell because she goes above and beyond. All the parents were equally impressed with her performance and the activities... I highly recommend taking the best package available, it is worth every penny I promise! The girls were thrilled with their craft and makeup! Can't recommend these ladies enough! I hope my daughter still loves princesses enough that I can use them again next year. Absolutely exceptional! !—DeAnna B. ...absolutely magical and honestly was the most fun we have had at a party! Emily is just delightful, so good with the children, and wow, what a voice! Thank you for just one of the best experiences for our little girl, her sister and all of her friends. Isla fell asleep talking about how Ariel actually came to her birthday party; she was just so happy. Thank you SO much for such a wonderful party! Chloe is still talking about it and has been telling everyone how Belle came to her house! Emily is beautiful and so talented. I was really impressed with the flow of the party, the kids were constantly engaged...you guys did a great job keeping them busy. All the parents at the party were so impressed with how you ran things. Thank you again SO much for making Chloe's party very special. 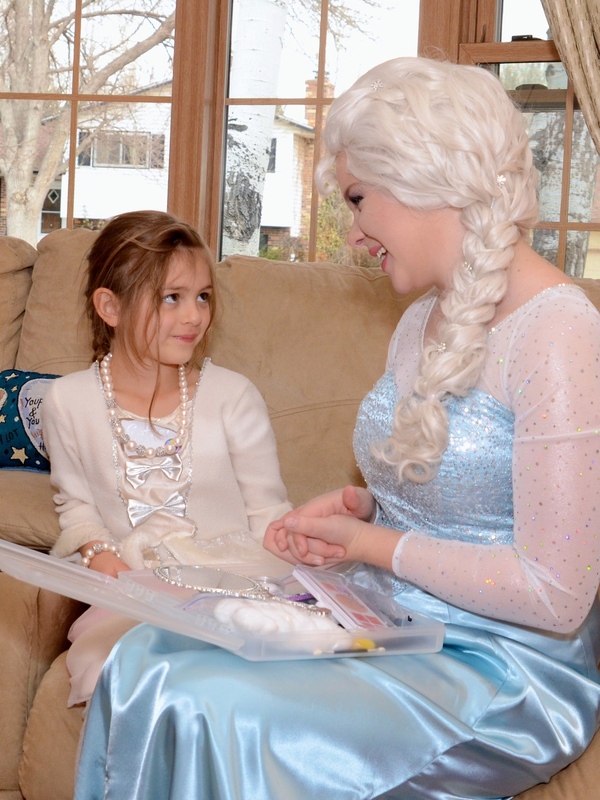 —Molly L.
The Snow Queen visited my daughter's 4th birthday party and wow'ed the crowd, children and parents alike. Whatever expectations we had were far exceeded…[she] engaged all the children, regardless of their individual personalities. Even the shy ones didn't take long to warm up to her...We couldn't be happier with the choice we made….Communication was always prompt. They are so easy to work with. —Tara B. We absolutely loved Simply Divine Entertainment! My daughter was thrilled to have Cinderella come to her party! They were on time, professional and provided us with absolutely amazing pictures! Thank you for everything! We will definitely be using you for all of our princess party needs! —Kelli S.
Emily is a trained actress and vocalist who also loves children. She has extensive experience working with children in a variety of settings including youth theatre camps and art programs. She is currently attending the University of Northern Colorado and is pursuing a degree in vocal music education. As business manager, Anne handles client communication, scheduling, costume development and online media. She has previously worked as a freelance writer, administrative assistant and, most recently, a K-8 art teacher.